[sjm4306] is one of those people. 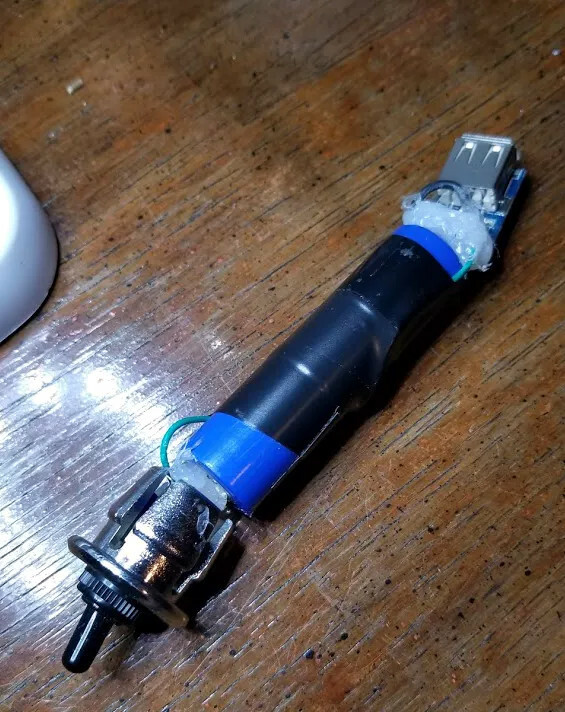 He wanted to add Bluetooth and some other modern niceties to a legitimate first-party SNES controller, so he picked up a broken one off of eBay and got to work grafting in his custom hardware. The final result works with Nintendo’s “Classic Edition” consoles, but the concept could also work with the original consoles as well as the computer if you prefer your classic games emulated. A custom ATMEGA328P-powered board polls the controller’s SPI serial shift register in much the same way the original SNES would have. It then takes those button states and sends them out over UART with a HC-05 Bluetooth module. The controller is powered by a 330 mAh 3.7V battery, and a charging circuit allows for easily topping the controller off with a standard USB cable. A particularly nice touch on the controller is the use of custom light pipes for the status LEDs. [sjm4306] made them by taking pieces of transparent PLA 3D printer filament, heating and flattening the end, and then sanding it smooth. This provides a diffusing effect on the light, and we’ve got to say it looks very good. Definitely a tip to file away for the future. On the receiving side, this project was inspired by a custom NES Classic Edition Advantage controller we featured last year, and borrows the work creator [bbtinkerer] did to get his receiver hardware talking to the Classic console over I2C. 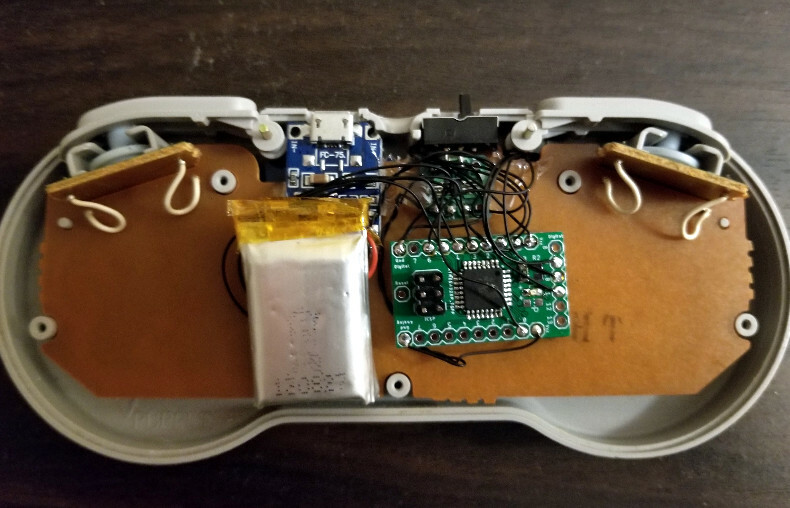 We’ve seen a number of projects which have added wireless functionality to the classic Super Nintendo controller, but most tend to be more invasive than this one. We like the idea of reading the controller’s original hardware rather than completely gutting it. Tank projects are great because while every tank design is the same in a fundamental way, there’s nevertheless endless variety in the execution and results. [Hoo Jian Li]’s 3D Printed Tank is smartly laid out and has an unusual tank tread that shows off some slick curves. The tank itself is remotely controlled over Bluetooth with a custom controller that uses the common HC-05 Bluetooth radio units. The treads are driven by four hobby gearmotors with custom designed wheels, and run over an idler wheel in the center of the body. There isn’t any method of taking up slack in the track and a ripple in the top surface of the track is visible as it drives, but the tank is small enough that it doesn’t seem to mind much. STL files and source code is available on GitHub; unfortunately the repository lacks a wiring diagram but between the low component count, photos, and source code that’s not a show-stopper. 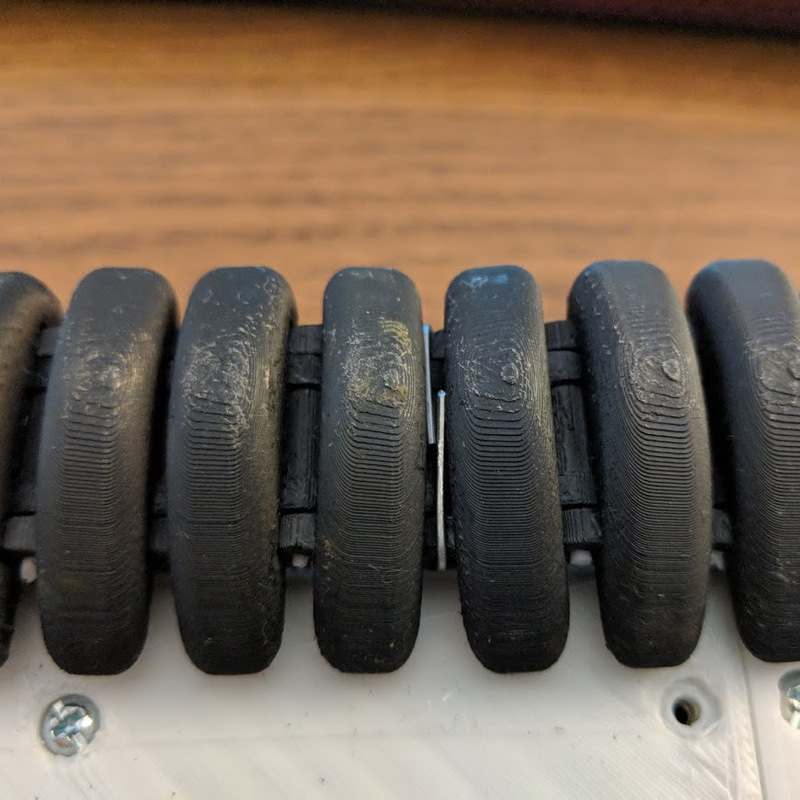 Tank treads see a lot of variation, from 3D printed designs for tracks that use a piece of filament as hinges to an attempt to use a conveyor belt as a tank tread for a go-kart. Some tank projects even eschew treads altogether and go for a screw drive. After you’ve taken a moment to ponder the turn of phrase used in the title, take a look at this scratch-built robotic vacuum created by [theking3737]. The entire body of the vacuum was 3D printed, and all of the internal electronics are off-the-shelf modular components. We can’t say how well it stacks up against the commercial equivalents from iRobot and the like, but it doesn’t look like it would be too hard to build one yourself to find out. The body of this rather concerned-looking robot was printed on a DMS DP5 printer, which is a neat trick as it only has a build platform of 200 mm x 200 mm. Once all the pieces were printed, a 3D pen was used to “weld” the sections together. The final result looks a bit rough, but should give a bond that’s just as strong as the printed parts themselves. The robot has four sets of ultrasonic range finders to detect walls and obstacles, though probably not in the positions you would expect. The right side of the robot has two sets of sensors, while the left side only gets one. We aren’t sure the reasoning behind the asymmetrical layout, but presumably the machine prefers making right turns. Control is provided by an Arduino Mega and the ever-reliable HC-05 Bluetooth module. A companion Android application was written which allows configuring the robot without having to plug into the Arduino every time you want to tweak a setting. 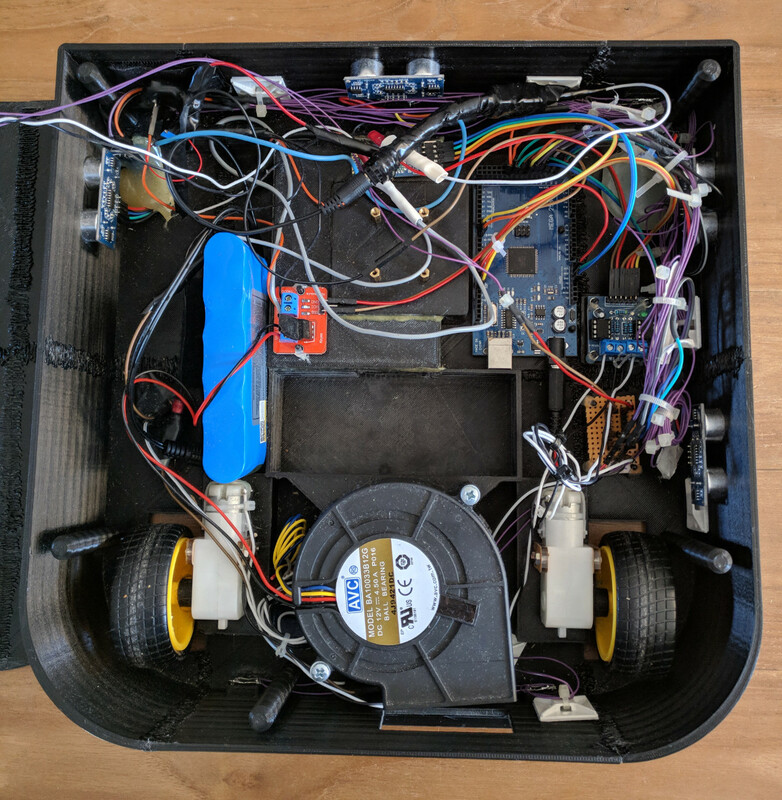 We can’t say we’ve seen that many DIY robotic vacuums here at Hackaday, but we’ve certainly featured our fair share of hacks for the commercially available models.